How do they do it? How do people get perfect points? Well, it starts with cutting correctly and measuring correctly, but we all know that. How about a few pointers (ha ha, get the pun?) on how to do this yourself? 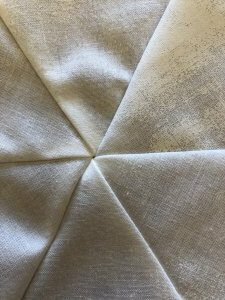 The secret is to not start at the very edge of the piece–well, that is, for triangles. Here, let me show you what I mean. Here’s a sample of what I have been sewing as of late. I am doing another book for C&T Publishing, so I can’t show you the whole thing. Suffice it to say that it involves a lot of little points, and triangles that are sewn together to create a hexagon. 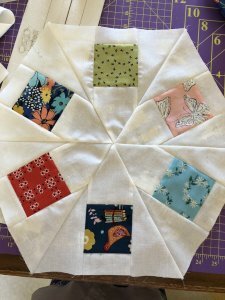 If you start 1/4 inch away from the very top of the triangle instead of sewing across the top, you will have greater success. I have a video for this very technique here on my website. Here’s the block, and yuo can see how perfectly the points come together at the center. That is accomplished by using one very simple trick. 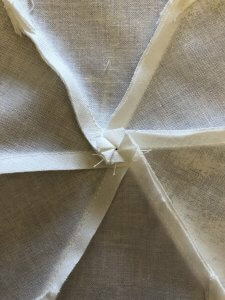 Don’t sew at the very start of the triangle. Start 1/4 inch in. Doing this, and pressing all the seam allowances in one direction, gives you this result. You will have a perfect little hexagon at the center that you can press flat. Check out the video. I have also uploaded it to Facebook and my you-tube channel, Bungalow Quilting and Yarn.